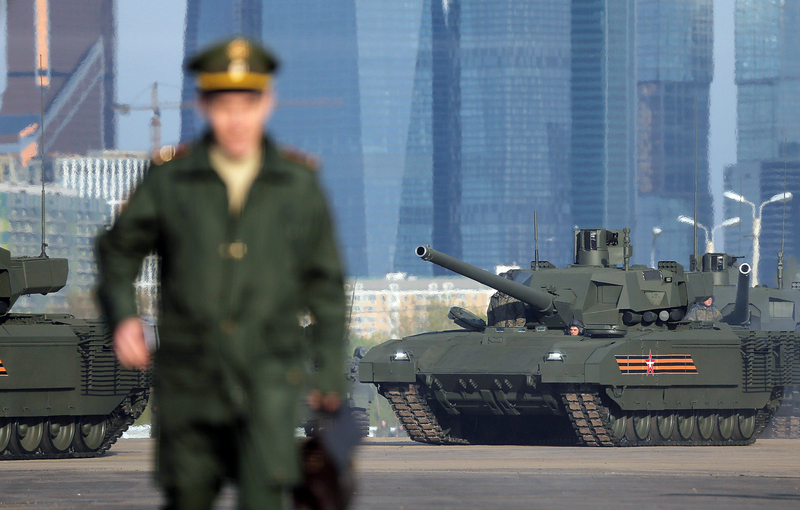 A Russian T-14 tank with the Armata universal combat platform is parked at a range before a rehearsal for the Victory Day parade in Moscow. Remote-control platform featuring new technology and capabilities will make its debut in 2018. Russian designers have begun developing a new demining vehicle to replace the outdated Zhuk system and its heavier counterparts. A source with knowledge of the design and procurement process told RBTH that one of the targets set by the Russian Defense Ministry for the new armored vehicle is for it to operate with limited human involvement. According to the source, the vehicle will be able to detect and destroy mines up to a distance of 650 feet. "Now the project goes under the name of ‘unmanned automated engineering reconnaissance and clearance system,’" the source said. The new system is expected to be controlled by an unmanned control system and an automated information point. According to military experts, the new vehicle will allow the infantry to break through enemy engineering fortifications. "The main problem is making a wheeled armored personnel carrier push a mine sweeper in front of itself to carry out full-scale mine-clearance operations," said Viktor Murakhovsky, editor-in-chief of the Arsenal Otechestva (Arsenal of the Fatherland) magazine, told RBTH. "It should be an assault breaching vehicle based on a heavy-tracked platform." According to Murakhovsky, it is difficult to imagine how engineers might design a wheeled armored personnel carrier that repeatedly strikes anti-tank mines, but continues to move through a minefield. "Consequently, the new robot is likely to be based on the platform of the advanced T-14 Armata tank," Murakhovsky said. The designers plan to present the first prototypes of the device in 2018. The United States military is also developing next-generation engineering vehicles for reconnaissance and assault breaching. The U.S. new hardware is based on the Stryker wheeled APC, which was used successfully in operations in Iraq. According to the "Military Balance 2016" report, the T-14 tank and other Armata-based armored vehicles are the first military equipment to have fully integrated active protection systems capable of intercepting both guided and unguided missiles. Military experts say that the new robot sapper will also use this system. "The new Russian combat platform will have a strong impact on the dynamics of the battle itself," Dmitry Safonov, a military correspondent for the newspaper Izvestiya, told RBTH. "Modern war is gradually transforming from a clash of armies into a confrontation between computer systems, where victory goes to those who have the superiority in technology." Tank with a "black box"
The introduction of advanced equipment, however, has increased significantly the already high cost of the vehicle and complicates its technical base. Izvestiya has reported that another technological advance present on the new robot will be onboard recorders that will provide a record of everything that happens when the vehicle operates in its emergency settings. "Onboard recorders are traditionally installed on the most expensive and complex types of equipment, such as aircraft, spacecraft and helicopters," independent military expert Oleg Zheltonozhko said in an interview with Izvestiya. "And at the moment, the cost and complexity of advanced samples of armored vehicles are approaching the price of such products."